Gemini Flies! Shayler David J. Add to cart the imprimé à la demande of Shayler David J. The short unmanned orbital flight of Gemini 1 that tested the compatibility of launch vehicle, spacecraft and ground systems. The unmanned suborbital flight of Gemini 2 to establish the integrity of the reentry system and protective heat shield. The three-orbit manned evaluation flight of Gemini 3, christened ?Molly Brown? by her crew. A mission recalled orbit by orbit, using mission transcripts, post-flight reports and the astronauts? own account of their historic journey. The missions of Project Gemini was the pivotal steppingstone between Project Mercury and the Apollo Program. 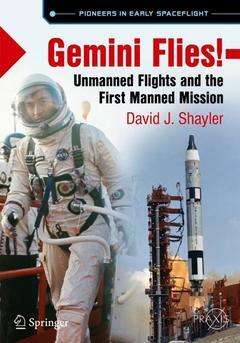 Following the success of its first two unmanned missions and the exploits of Gus Grissom and John Young on Gemini 3, NASA gained the confidence to plan an even bolder step on its next mission, as described in the next book in this series on Gemini 4. Author's Preface.- Acknowledgements.- Dedication.- Foreword by Colin Burgess.- Abbreviations and Acronyms.- Prologue: Molly Brown is on her way.- Chapter 1: Mercury Mark II.- Chapter 2: A "Clean and Green" Flying Machine.- Chapter 3: Ramming the Atmosphere.- Chapter 4: Preparations.- Chapter 5: Guts and John.- Chapter 6: All Systems Look Go.- Chapter 7: Molly Brown "Performing Nicely".- Chapter 8: Got Your Seat Belts Hooked?.- Chapter 9: The Unsinkable Molly Brown. Chapter 10: Gemini Operational.- Appendix I.- Appendix II.- Appendix III.- Bibliography.- About the author.- Other works by the author.- Index.